When the Rockers debuted on WWF television in 1988, there wasn’t much distinction between Shawn Michaels and Marty Jannetty. Michaels was two inches taller, but Jannetty was more mature — steadier in the ring and much looser in promos. But it wouldn’t last. By 1990, Michaels had emerged as the top Rocker: He had found some store of buried charisma and taken over chief promo duties while Jannetty languished, reciting the same trite lines (“We’re gonna rock and roll, strut and stroll”) and receding into his drawl. When they came face to face on Brutus “The Barber” Beefcake’s interview show in 1991, the Rockers had been at odds onscreen for weeks. Fans like me were hoping to see their favorite team patch things up, but Michaels’s devilish leather jacket suggested something more calamitous. When Jannetty gave his partner a last chance to reconcile, you could almost hear the desperation in his voice: “If you wanna stick together and make this thing work, when I turn around we’re gonna shake hands, and we’re gonna go on and rock and roll like the Rockers can do.” Those were Jannetty’s exact words, but his message was “Please don’t leave me.” The same dynamic had been playing out in real life. The Rockers’ backstage relationship was strained — rumor had it that Michaels had sent Jannetty to get an offer from another company, only to act shocked when Marty mentioned it to Vince McMahon. Vince decided to split the tag team, and Shawn couldn’t have been happier. Marty freaked out. He wanted to keep the band together. He knew what the rest of us hadn’t quite realized yet: He was the second banana. Second bananas in pro wrestling arguably date back to the sport’s earliest days of quackery, when touring champs would travel with “policemen” whom prospective opponents would have to go through before challenging for the belt. The most famous of this sort was Toots Mondt, who was one of pro wrestling’s greatest minds and a behind-the-scenes second banana to Vincent J. McMahon before his son, our beloved Vincent K., took over the family business. The second-banana phenomenon in pro wrestling really hit its stride in the ’80s, though, thanks to the nationally televised interview. Suddenly, characters consisted of more than the sum of a promoter’s booking and a wrestler’s presence at live events. Tag teams took on personalities, and in turn partnerships became strained when one wrestler left another behind. Jim “The Anvil” Neidhart is in some ways the Platonic ideal of the wrestling second banana. After Bret “The Hitman” Hart went out on his own (also in ’91, when Michaels dumped Jannetty), Neidhart was a hirsute goblin left adrift. “The Anvil” was then shoehorned into an awkward team — and an even more awkward pair of parachute pants — alongside Bret’s brother, Owen. Neidhart’s only moments of significance from then on came directly in Bret’s shadow, as part of Bret’s onscreen posse in both the WWF and WCW. Of course, sometimes being the second banana is part of the script. In 1986, “Mr. Wonderful” Paul Orndorff was Hulk Hogan’s running mate, helping him fend off baddies like Roddy Piper and the Heenan Family. “Adorable” Adrian Adonis mocked Orndorff, calling him “Hulk Junior” — a crack both about his spot on the card and his relative shrimpy-ness next to the Hulkster. Eventually, Orndorff chafed at his role: He felt overshadowed and disrespected, and ultimately blew his lid because Hogan wasn’t returning his phone calls. And much like Jannetty’s, Orndorff’s second-banana status was codified in real life. It’s rumored that Orndorff was Hogan’s literal understudy — if Hogan hadn’t signed with WWF in 1983, Mr. Wonderful would have gotten the role. But Hogan joined the company, and the rest is history. Along with Hogan came his old friend and long-ago tag-team partner, the aforementioned Brutus “The Barber” Beefcake. The Barber was a longtime second-tier player (and overmatched talk show host) in the WWF, thanks in no small part to his relationship with Hogan, and the two teamed up as “The Mega Maniacs” in 1989 — a notable drop-off from Hogan’s unions with Randy Savage and the Ultimate Warrior. When Hogan decamped to WCW, Beefcake followed, and there he found himself constantly repackaged with various inane gimmicks — Brother Bruti, the Butcher, the Man With No Name, the Zodiac, the Booty Man, the Disciple. Each incarnation was another halfhearted attempt to disguise Beefcake’s true identity, and by the time “Rowdy” Roddy Piper revealed that the Disciple was actually Brutus, the whole thing felt kind of sad. Speaking of WCW, there was no second banana more legendary there than Arn Anderson, a genius ring technician and all-around badass who looked like a cross between a chemistry professor and your friend’s tough dad. 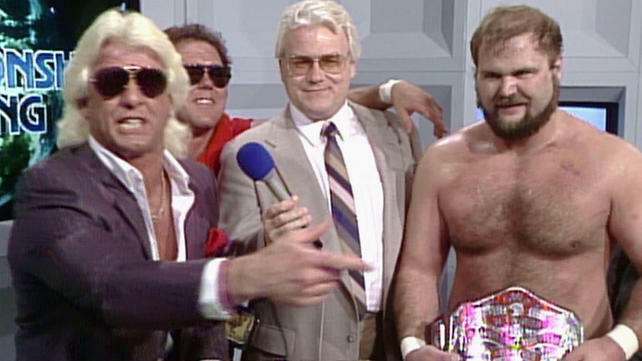 Anderson found fame as a member of Ric Flair’s Four Horsemen — along with third banana Tully Blanchard and a rotating cast of others. 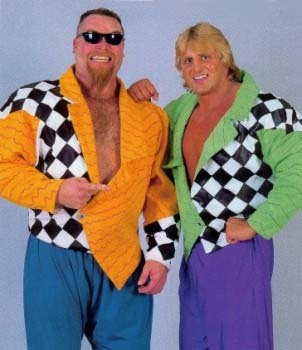 Anderson was the group’s rock, its workhorse, and its spirit animal, but he never looked comfortable in the expensive duds the crew favored, and he never found much success outside of Flair’s estimable shadow. When Anderson and Blanchard jumped ship for the WWF in 1988, they arrived with a high-profile thud; minus the Nature Boy, they were stray bananas. They came back to the fold — and into Flair’s welcoming arms — a year later. Of course, there were second bananas all over the wrestling world — Kevin Von Erich, Buddy Roberts, and Greg Gagne are but a few of them. I spent my formative years watching “Superstar” Bill Dundee, Dutch Mantell, and Jeff Jarrett alternate between being enemies and second bananas to Southern wrestling legend Jerry “The King” Lawler. But the best second banana to come out of Memphis was Soul Train Jones, who made only a handful of appearances before WWF hired him to become Virgil, the manservant of “Million Dollar Man” Ted DiBiase. The “Million Dollar Man” character was an onscreen proxy for Vince McMahon (who was still a decade away from actually getting in the ring himself), and the name “Virgil” was swiped from the birth certificate of Dusty Rhodes, the wrestler who was then calling the shots at rival WCW. WWF wanted to be sure WCW knew which banana it was on the promotional landscape. Virgil spent several years suffering the humiliation of indentured servitude to DiBiase before finally turning on him in 1991 (WWF’s year of the untethered second banana, it would seem). Virgil and DiBiase had a memorable feud, after which Virgil faded into obscurity before being resurrected as “Vincent” (touché! ), again alongside DiBiase, in WCW. In recent years, Virgil has become most famous for showing up uninvited to peddle autographs at wrestling events, sports games, and subway stations. 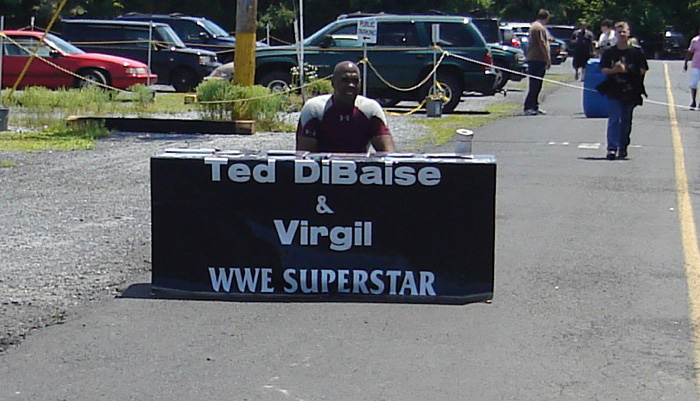 He has a sign that says “Ted DiBiase & Virgil WWE Superstar,” though it’s not clear that DiBiase has ever sat in front of that sign. Sadly, it seems that the second bananas of pro wrestling are defined too often by the ignominy they face in their real lives. After the Rockers split, Jannetty attacked a police officer and was sentenced to six months of house arrest, ruining any plans the WWF may have had for him. WWF cut him from the roster again the following year for supposedly being under the influence during a match, and Jannetty disappeared again in 1994 after a gravely injured jobber sued the Rockers and the WWF and won $26 million. Neidhart was arrested in 2010 and charged with drug trafficking. During his feud with Hogan, Orndorff injured his arm and neck, but out of concern for losing his no. 2 spot, he continued wrestling and compounding his injuries, which eventually forced him to retire in 1988. Many people thought he had died. (He returned to the ring in 1990.) In 2004, while working for the Boston transit system, Beefcake caused an anthrax scare when a subway rider noticed a bag of cocaine that Brutus had left out in the booth he was manning. Anderson is the exception who proves the rule. Since WCW closed shop in 2001, he has worked backstage at WWE, forestalling the dishonor that befell his second-banana brethren. Since moving behind the scenes, Anderson has made sporadic appearances, always in service of one Ric Flair story or another, like celebrating the Nature Boy’s retirement, or getting mangled by Flair foe the Undertaker, or getting pissed on by Steve Austin. Nobody ever said the life of a second banana was easy.